By its very nature, Do-Ho Suh’s Rubbing/Loving Project at 348 West 22nd Street, New York, NY 10011 is proving a monumental enterprise. 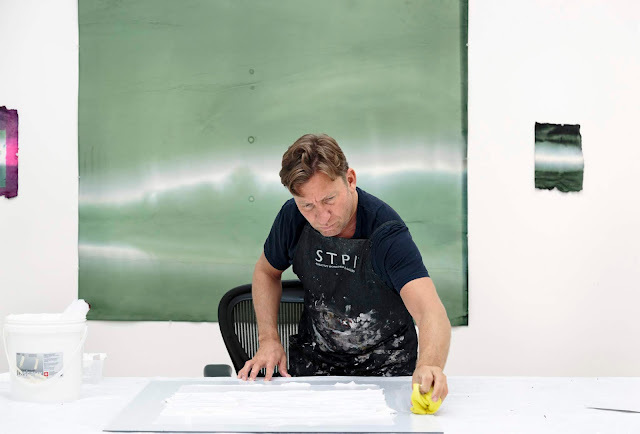 Suh, who is internationally recognized for his diaphanous architectural installations that recreate personal spaces on a 1:1 scale, has just completed the first part of the work: making paper rubbings of all interior walls, including fixtures and fittings, of a four-story brownstone in New York, where he used to live. Suh's apartment rubbed in yellow. The pink-rubbed door leads to the staircase and up to the townhouse. 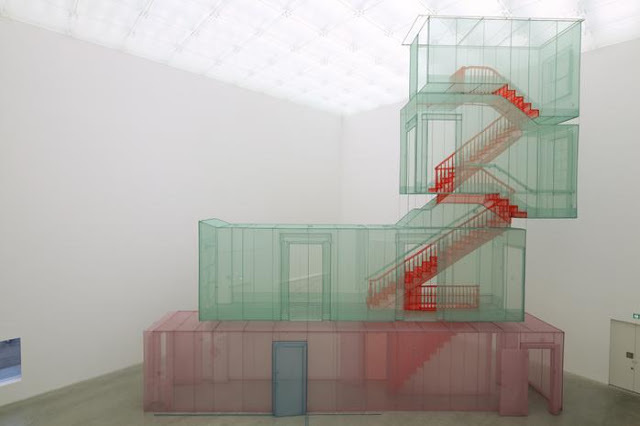 Eventually, Suh plans to recreate the house interior in its entirety allowing visitors to walk through it, as they currently can do in one of his other projects, Hubs — a fabric installation comprising a series of 1:1 scale recreations of transitional spaces (such as corridors) from various houses Suh has lived in around the world — that occupies the 25-meter length of Victoria Miro Gallery’s Wharf Road space in London. Even though monumental projects have existed throughout art history, it was only in the second half of the 20th century that artists mastered the challenges of the scale, aided by technological changes and new materials, such as Plexiglas and weathering steel (also called COR-TEN). 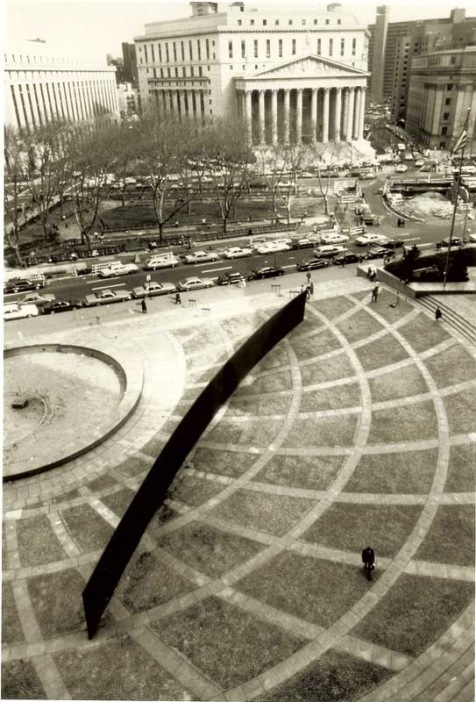 Arnold cites the pioneering works of American minimalist artist Carl Andre, whose large floor artworks invite viewers to become part of the works as they walk on them, along with pieces by Basque sculptor Eduardo Chillida, who carves out beautiful negative spaces with his huge COR-TEN steel sculptures, and Richard Serra, whose towering sheets of shaped oxidized steel engage viewers to renegotiate their relationship with the artwork and its surroundings. In the 1980s, Serra’s 20-foot-long Tilted Arc sculpture provoked an outcry because it prevented easy passage across Federal Plaza in New York, but the artist refused to reposition the work, declaring it would be akin to destroying it — it was eventually removed eight years later. Today, his sculptures are some of the most sought after at auction, with a world record $4.27 million achieved at Christie’s in 2013 for L.A. Cone (1986), a nearly 15ft-tall sheet of steel. 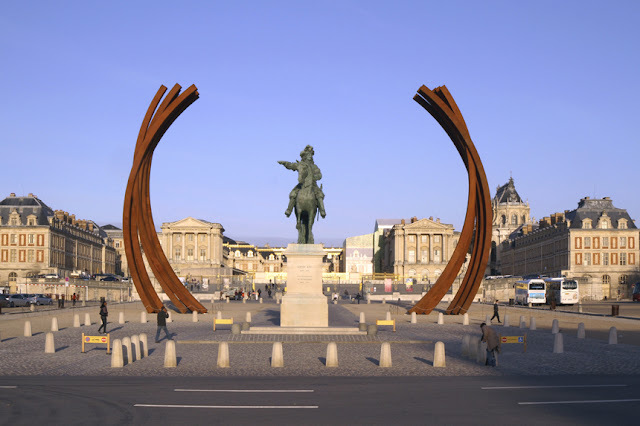 Monumental artworks sited outdoors can be quite aw-inspiring. Christo and his late wife Jeanne-Claude, have created some of the most extraordinary large scale installations using fabrics that have in turn wrapped Paris’ oldest bridge, enveloped Berlin’s Reichstag, and draped 2.4kms (1.5 miles) of high cliffs on an Australian coastline. 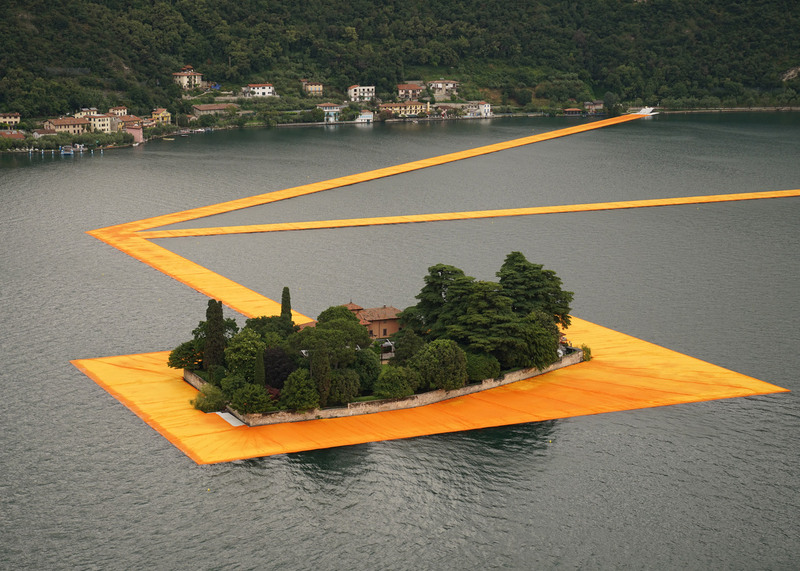 Last summer, Christo unveiled The Floating Piers, a bright orange geometric intervention on Lake Iseo in Italy that allowed more than 1.2 million visitors to “walk on water,” as the 81-year old artist put it, via 220,000 high-density polyethylene cubes covered in saffron-colored nylon. French artist Daniel Buren was one of the pioneers of installations that directly respond to the space for which they are created — his first larger scale work in 1971, a 66ft. x 32ft. canvas banner with his now signature vertical stripes, bisected the famed rotunda of the Guggenheim Museum and was controversially removed before the opening of a show (after other artists complained it was hiding their works). Buren went on to become one of the most celebrated large scale installation artists, with permanent installations in the courtyard of the Palais Royal in Paris and London’s newly refurbished Tottenham Court Road station, amongst many others. 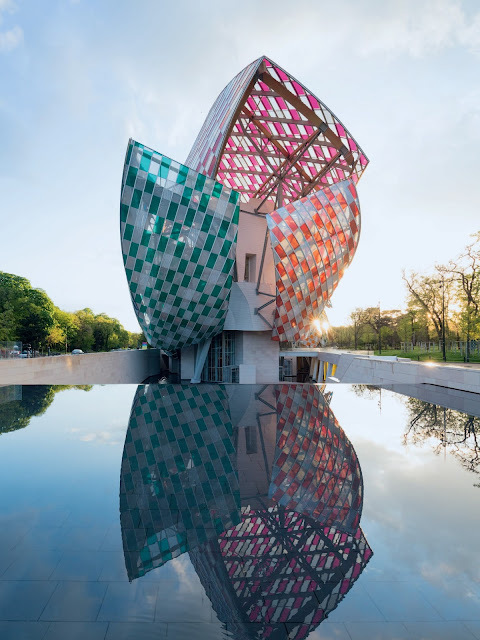 His most recent ephemeral installation, Observatory of Light, on view until April, transforms the 12 glass ‘sails’ of the Fondation Louis Vuitton’s roof in Paris creating a riot of color that cast a new light on the iconic building designed by Frank Gehry. 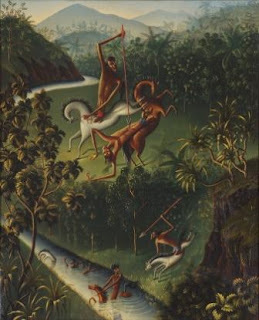 Nowadays, art lovers can appreciate monumental art in large hangar-like buildings at art fairs and some art galleries around the world have especially large spaces to present them, with the same large scale work sometimes taking on different connotations depending on the building or outdoor setting. “Interior space and exterior landscape can have equally impressive results. It all depends on the characteristics of both the work and the space it inhabits. The geometry of architecture can complement the composition of a sculpture; likewise the contours of a landscape. An enclosed space can emphasize the power and prowess of a large scale piece, and yet can equally create a sense of intimacy,” points out Neil Wenman, Senior Director, Hauser & Wirth, which is currently organizing an outdoor exhibition of Alexander Calder’s monumental works in Gstaad. One great pilgrimage to make each year to celebrate large scale artworks is the Unlimited section of Art Basel, which showcases the wide variety of media being used and places rising stars alongside established artists. Last year’s edition displayed 88 monumental projects including Frank Stella’s 15-meter-long painting Damascus Gate, Stretch Variation I (1970), which according to The New York Times sold for $14 million; Gretchen Bender’s 24-monitor multi-projection screen installation, Total Recall (1987); Chiharu Shiota’s Accumulation: Searching for Destination (2014), an installation of over a hundred vintage suitcases suspended from the ceiling at different heights; and Ai Weiwei’s White House (2015), a traditional Qing Dynasty-style house created from white painted reclaimed wood set almost precariously on glass orbs. Hans Op de Beeck, The Collectors House, 2016. One of the most critically-lauded pieces was Belgian artist Hans Op de Beeck’s The Collector’s House (2016). 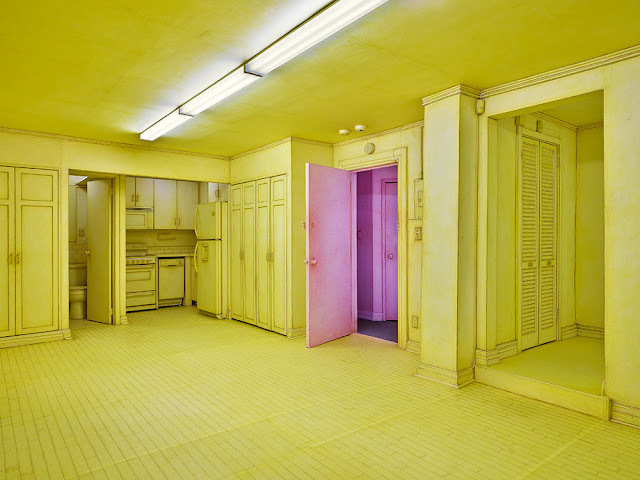 The immersive installation (priced around $820,000) invited visitors to enter the home of an aesthete where time appears to have been frozen and everything is gray as though covered by volcanic ash in a modern Pompeii-like scene that was at once disturbing and serenely meditative. When the Unlimited section was first started in 2000, buyers of those large pieces were essentially museums and large public institutions, but in recent years, private collectors have increasingly acquired such pieces, sometimes building suitably large private museums to display them. 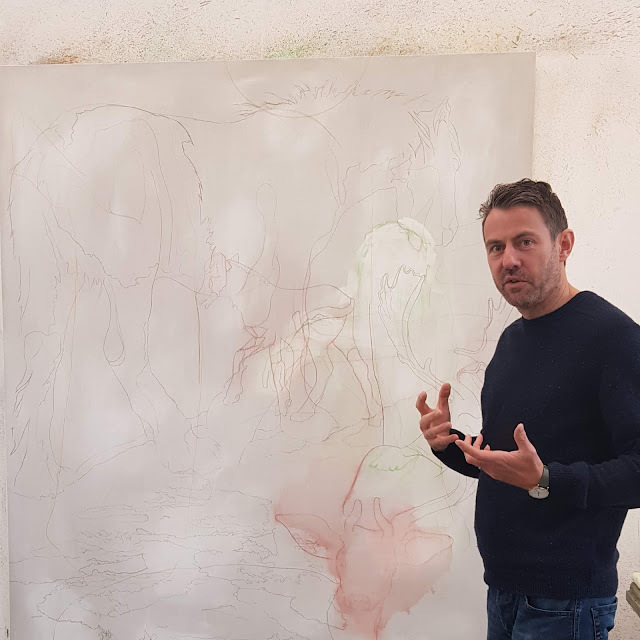 The cost and time commitment associated with them means patronage remains extremely important for emerging artists wanting to realize work on a monumental scale. The foundation, with which Christie’s has collaborated, introduced the hugely successful Fourth Plinth project at Trafalgar Square in 1999, bringing outdoor sculpture to the public with a succession of exceptional commissioned works, and most recently the foundation presented a major exhibition of newly commissioned outdoor sculptures by contemporary Chinese artists including Cui Jie, Wang Yuyang and Rania Ho. So if you stand by one of his columns, express your feelings, the artist might very well be next to you.